Greek yogurt has more than twice the protein yet fewer carbs than regular plain yogurt and has a much thicker smoother texture that is absolutely delicious. Yoplait and Carbmaster are not 'real' yogurt they are water thickened with starches. Use the real deal! Go Greek. Place fruit in a medium saucepan over medium heat and stir occasionally with a wooden spoon while it heats. Stir in Truvia and lemon juice; cook until fruit 'pops', juices have released and mixture has thickened slightly, 4 to 5 minutes. Blend cornstarch with 1 tablespoon water in small cup, blend into blueberries, stirring constantly and cook until thick and glossy, about one minute. 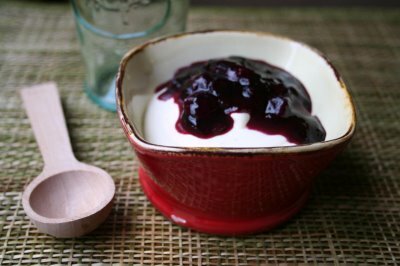 Serve warm, or place in small bowl and chill in fridge to flavor Greek or regular yogurt or ricotta cheese. This entry was posted in Bariatric Recipes, Eggs & Cheese, Sauces & Salsa, Vegetable Main Dishes & Sides and tagged Dressings, Dressings, Sauces & Salsas, Eggs & Cheese, Vegetarian.